Skelair International has recently supplied JTS Geotechnical Solutions Ltd with a Baby Giraffa for a large-scale project in Brighton. Working as part of the Royal Sussex County Hospital £486million redevelopment (the 3Ts redevelopment), JTS Geotechnical Solutions Ltd was hired by the main contractor, GallifordTry. JTS Geotechnical Solutions Ltd is a specialist geotechnical contractor offering both installation and design, and installation services for such works as ground anchors, soil nailing, drilling and grouting, piling and earth retaining walls. Prior to the construction of the Clinical Admin Building, JTS Geotechnical Solutions Ltd was contracted to secure the chalk-based wall at the rear of where the new building would be. 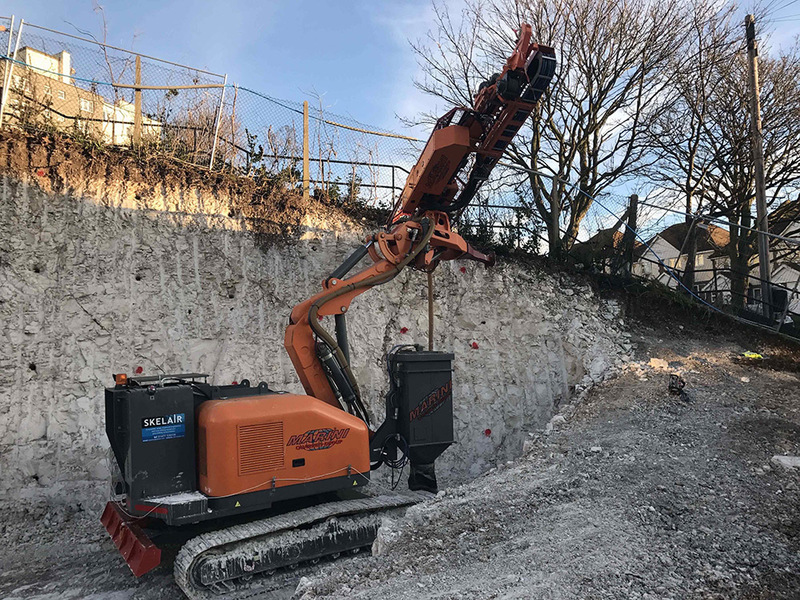 In order to secure the wall fully, JTS Geotechnical Solutions Ltd had to dig into the chalk banking, which was at a 30° slope to set it at an 80° slope. “The chalk ground presented some challenges,” said James Fram-Taylor, Managing Director at JTS Geotechnical Solutions Ltd.
“Initially we hired a rotary percussive drilling rig to undertake the work but the chalk was soft and wet at approx. 2.5mtrs deep and it was clear that the self-drilling method was going to be an ineffective method,” continued James. After hearing about the challenge faced, Skelair recommended the Marini Baby Giraffa, a highly flexible and lightweight rig that’s capable of squeezing into tight spaces – perfect for the task in hand. Once on-site, the Baby Giraffa was tasked with drilling 290 ground anchors, 6 metres by 100mm in diameter, in a 1.5metre horizontal and vertical formation. “The Giraffa was capable of open hole drilling, leaving a perfect hole in the chalk when withdrawn, which was exactly what we needed. I was really impressed with its capabilities, it’s a drilling rig and with its versatile mast that can drill from any position and managed to get into a tight space that no other rig could have managed; it really came into its own on this project,” said James. Once the drilling was completed, JTS Geotechnical Solutions Ltd retracted the auger and pumped in liquid grout followed by a 32mm reinforcement threaded bar. A black heavy duty drainage membrane was placed on the slope and it was secured in place with a heavy duty 7mm reinforcement mesh then 225mm diaphragms were fitted to the 7mm mesh at 500mm centres then 350mm bearing plates were placed over the nails then a domed load nut was fitted. At this point a 4mm mesh was then fixed onto the diaphragms which formed a mini gabion mattress that went all the way to the toe of the wall. A 40/75mm stone was then poured into the basket from the top of the slope and formed the newly stabilised wall. James concluded: “The stones tend to be for aesthetics but they can also help with the drainage from the wall,’ concluded James.